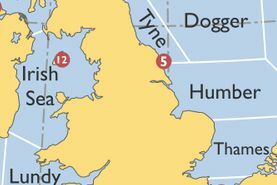 A nice series running on a 'neighbouring' blog. Look at the whole series. The battle in Rava's cover plate from Osprey NV244 is apparently that at Sena Gallica in 551AD. I looked further on his FB. 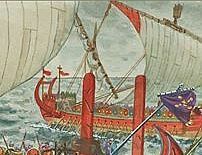 This was a battle between an Italian Gothic fleet and Byzantines. The Goths lost heavily. This is an obscure battle, mentioned only by Procopius. Quite helpful in making a fantasy-full reconstruction. My criticism of the galea-bireme-dromon ship stands. Elsewhere, Procopius clearly states that the ships of Belisarius reconquista were single-banked, cataphract, with possibly a lateen rig. (History of the Wars, Book III, xi). These were called dromon(es). The depiction closest in time is here, from the Vatican Æneid folio 77. 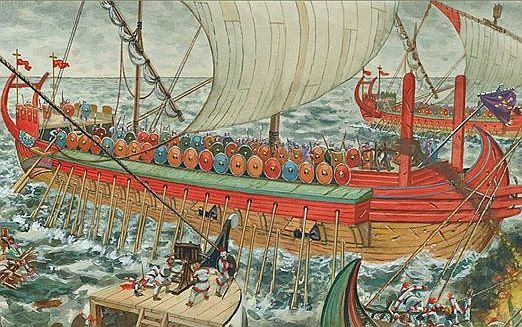 That the Goths had a fleet of similar vessels to the Byzantines of this time is ... debateable. 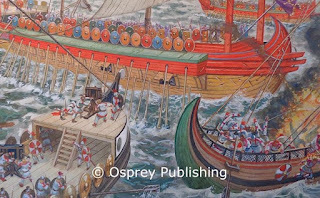 It is nice that Procopius mentions the sides engaged with arrows and lances and swords, But fire-projectiles, always a risky tactic at sea ? And super-explodey ones too. The Gothic ship at lower right is ...odd. 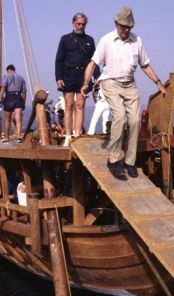 Why should a railing run up into the vertical on the stern ? Who is going to fall off sideways there ? And nice uniforms by the Gothic army. 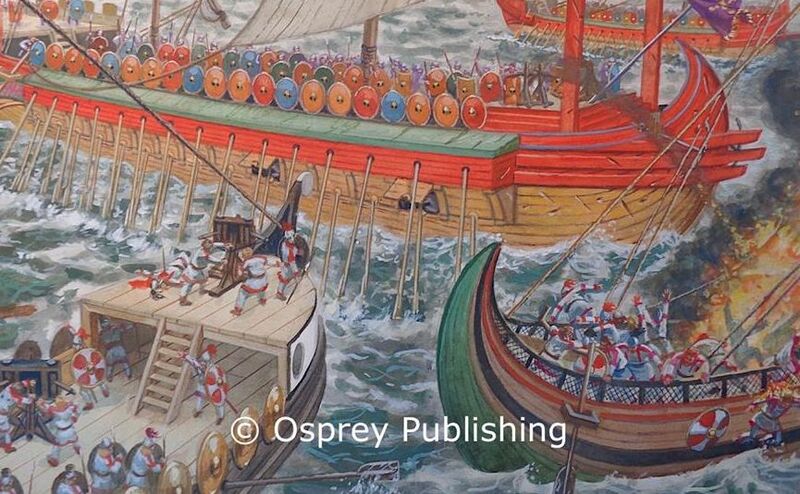 A naughty detail is that the ship at the back - a galea-medieval-dromon , has the upper corne rof its mainsail colourd red. 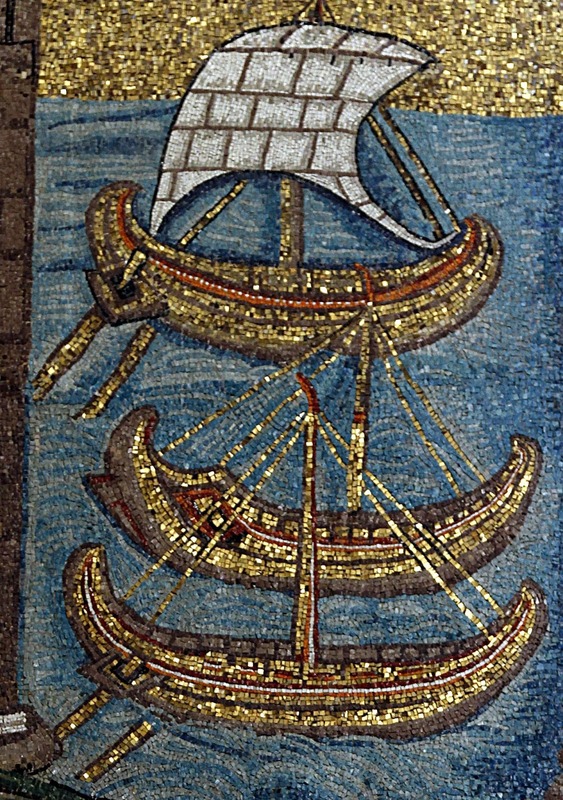 According to Procopius, Vandalic War xi - on his expedition to Africa in 533AD, Belisarius had the sails of his own and two other ships which carried his personal guard coloured red in the top third. Just a leetle tweaking to get his feature over to Sena Gallica eighteen years later. Anyway, the oncoming book is getting even more interesting. A sail is sighted over the horizon! 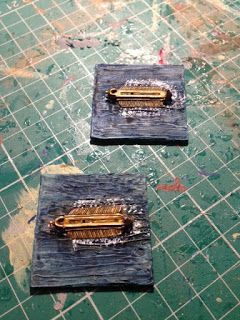 A first view of the oncoming Osprey New Vanguard 244 Imperial Roman Warship 193AD to 565AD. Giuseppe Rava has been unable to contain himself and released a view of the cover before the publisher themselves have. The splendid view of a medieval galea equipped with personal little escape ( or ventilation ? ) doors for the rowers, a spectacular plinth for the bow-ballista near the bows which offers zero protection, a mammoth stern-castle and - a sight not seen for a couple of hundred years ...( and never seen again ..) an oarbox. Keeping the arrows out ! This oarbox is a special one with an open top. This open top has to be covered with a tarpaulin to keep arrows out. The oars are bizarre - try to extend the angle of the upper oars into the ship and imagine how much space there is to row with the things ......They plunge into the sea at an extreme incline. The lower rank of rowers have it better, they are have little hatches to open if things get too smelly inside. They may even be naked in there ? Their oar shafts are not so steeply inclined so they have it easy. 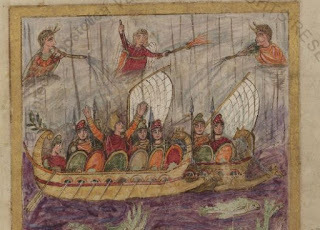 The rig is lateen, so this would argue for the vessel being a dromon but the fact that it is a bireme means it cannot be a dromon. : unless we are in the period well after the stated terminus for the book of 565AD. The steering oar is acting through a truly massive bracket stuck to the side of the vessel. Looks like a literal interpretation of a mosaic picture. I do not know what the scenario for the picture is - maybe the battle of the Hellespont in 324AD where Constantinian forces defeated those of Licinius: hence the Christian emblems on the main vessel. The bow of the ship coming into the picture from below is equipped with a forecastle mounting a torsion ballista. The planks that floor this position are something like 10 or 15 cm thick and 60cm wide. They shouldn't break in combat. The forecast remains bleak for the third New Vanguard by the Deadly Duo, D'Amato and Rava. Italian Blight; Hot air soon: Poor to severe becoming tragic: Low expectations, filling slowly with dubious interpretations. Text, moderate to dull. Of course, I may be proved quite wrong.